Full blunt cut bangs across the forehead are the hot hairstyle trend for spring. They are chic, stylish and instantly draw attention to your eyes. Wear them just below the eyebrows for a modern look, or cut above for a more retro look. Do you want to try out the look but are afraid of the commitment? Well, ladies, you can have your cake and eat it too with clip-in-bangs. They are affordable, super easy to put in, and are all the "must" without the fuss. I purchased these HairDo clip-in bangs by Ken Paves and Jessica Simpson for $29 at Ulta3. It is good quality synthetic hair. Other local beauty supply stores (such as Sally's) carry clip-in bangs and offer a variety of choices. If this is a look you want to try, my advice would be to purchase 100% real human hair so it does not look so "wiggy" and cut them to suit your face so they look like they were made just for you. I attempted to cut these myself (and I am wee bit embarrassed). Bottom line, hair is all about having fun and expressing your personality. If full blunt cut bangs are something that you debating on doing, I say go for it 100% and don't look back! But, if not, clip in's are always a fun alternative. P.S., I am SO in love with this new Essie nail polish. The color is "Turquoise and Caicos" and I think it is going to be a super hot hue for Spring, so put it on your radar! LOVE the nail polish!!! It's perfect for Spring. You look truly fabulous with bangs. Any chance you're going to cut for real? Love the nail polish too. I'm about done with my current color. Thanks. You look awesome with bangs, synthetic or not! I have been thinking about getting those bangs for the longest time but have shyed away from it. love the idea of the clip ins! and cute color! That nail polish is gorgeous! You also looks great with bangs. oh my! i need those! love love! ive never even heard of them before! perfect! I love the bangs. I cut my own and then I hated the look so I just side sweep them. Maybe I should try this. Love it. So fun that you can try it out! I think I may .. you rock the bangs well. I say go for the real thing! well shut the front door. bang problem solved. amazing. wow, love the blunt bangs look on you! i will have to try these out! I have never heard of such a thing as clip on bangs!! I might have to invest in these.. I was going to send this link to Megan from Across the Pond, but apparently she found you herself. You are quite the smarty I must say. I really didn't have any desire to get bangs, but they look so good on you now I kinda want them. The bangs look so natural! You did a fantastic job! To answer your question on my blog; I use a Canon EOS 20D! Love, love, love the bangs! They look so natural! 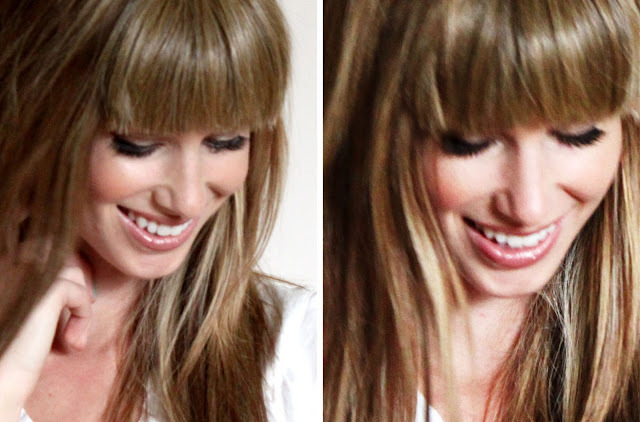 You can totally rock straight across bangs. And that nail polish is very sweet. :) Perfect for Spring! i think i might try these. i want bangs so bad but regret it every time i get them! You are too pretty! Who knew clip in's could look so natural?! I love them! I think this look is a winner! Def going to pick up that polish when I leave work...i am headed on a cruise next week and I think that would be the perfect shade! I have to say... I am so glad I cut my bangs! LOVE THEM!!! Oh and my toenails are painted in that color! Love turquoise and caicos! Got so Excited when Essie (one of my advertisers) sent me that whole collection last spring, Loves them for that! SO fun! The bangs look great on you! & I've seen that essie color, but not on anyone - looks great! I might just need to go pick it up! You should do a tutorial on how to clip in the bangs like you did the other extension video. :) You look so cute with them!! I love it. you are ADORABLE! i still don't get how these stay on, lol! but they do look great on you! and turquois and caicos is a fave of mine! actually all essies...because i discovered that they last a long time without chipping! Which color bangs are you wearing? They look marvelous!